I came across an article recently, Coping with the Loss of an Online World, and have been thinking about it since then. I admit to never having heard of this world, but that’s really not surprising, since there are many virtual worlds, probably hundreds (although I couldn’t find a number readily in my Google searching). 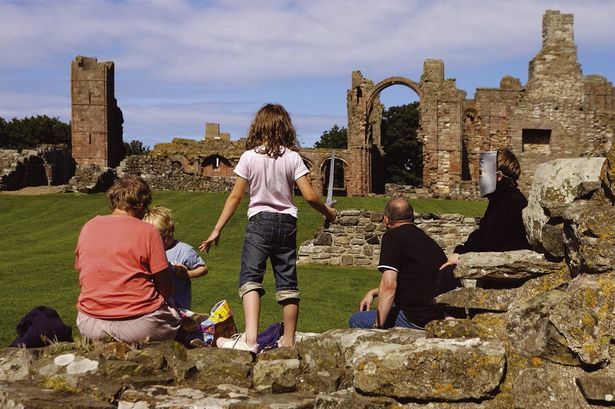 What stood out to me in reading this article was that this world, and, no doubt, many others, provided a platform for family members to connect with each other. In a day and age when families are spread out, that’s not a small accomplishment. The power of virtual immersive platforms becomes really clear when you find a place in a virtual world that really uses the environment effectively. The International Transgender Hate Crimes and Suicide Memorial provides an excellent example of such a space. To start, the memorial is a peaceful, visually appealing place: a beautiful building and surrounding green space, with the sound of waves crashing at the shore. The dark granite walls, reminiscent of the Vietnam Memorial Wall, lend a somber tone to the space and the feeling of being in a protected enclave. Upon entering the building you encounter an alter filled with pink and blue candles. This is the memorial for transgendered people who have died from suicide. Each candle has a name associated with it and when you click on the candle a description of what happened to that person comes up in the chat. I clicked on quite a few of the candles: the tragedy of these deaths comes through loud and clear. Nearby the altar is a box where you can submit a request to light a candle for someone. Outside there are headstones, each one representing the homicide of a transgendered person. Once again, as you click on each headstone a description of how the person was murdered is shared in chat. The horror of these deaths is palpable. There are two large pillars on either side of the memorial which have names etched in brass, listed by year. Currently there are names going as far back as 1998, but one of the memorial creators, Random Demin, told me they have names going back 40 years. Its hard to describe the emotional power of this place. I felt a deep sadness and anger: the candles, headstones and list of names all come together to drive home the violence, loss and utter senselessness of these deaths. The information here–about the violence our society perpetuates against transgendered people–is not new to me. But this information is delivered with a powerful punch: the names of people and the stories about their death personalizes the information in a way that statistics can’t. Suicides often invoke shame for survivors, and shame isolates people and grows stronger in isolation. Certainly there is a lot of cultural shame that is levied on transgendered people. Standing in front of those candles–yes, even standing as an avatar–one can sense the power of numbers. All of a sudden it’s no longer about one suicide…it’s about many suicides and it’s about a world that hurts people for who they are, hurts them so much that they feel they have no choice but to leave it. This awareness of the larger context can help support a transformation of shame into anger: anger at the conditions that make it a hostile world. You can memorialize someone you’ve lost with a candle or a headstone by contacting the site’s creators. This is a powerful symbolic act for many people in real life and virtual life. It burns perpetually, both in memory of the loved one and bearing witness. It’s hard to come to this memorial space without seeing the larger context: a society that is hostile to a group of people. Understanding this larger context provides a deeper level of understanding and potentially can become the impetus for taking social action. Taking action is taking power back, and powerlessness is part of the core of what is so difficult when a loved one is lost to a traumatic death. Building this memorial space is both a healing act and an act that challenges our larger society to take stock of such senseless deaths and challenge the people and culture that perpetuate this violence. Random Demin was able to give me some background on this project. She and Gwen Collins created the memorial in 2007 and held their first 24 hour vigil there that year on the International Transgender Day of Remembrance, November 20th. This Day of Remembrance was established in 1999 by Gwendolyn Ann Smith. 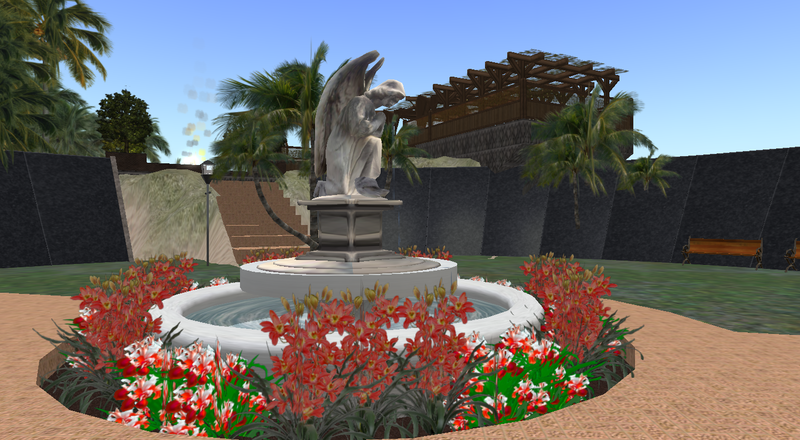 Moreover, the project has a larger long-term goal of creating a memorial in real life. 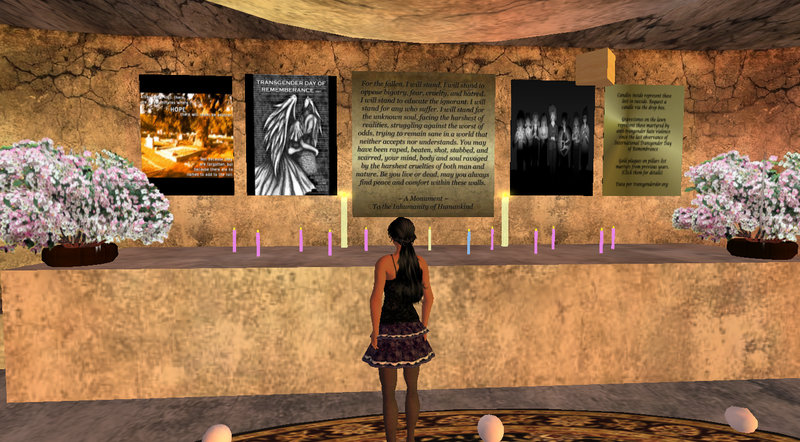 In the mean time, Second Life provides a good substitute that can fill some of the functions of a real life memorial in a safe place. This memorial is a wonderful example of the power of virtual placemaking in terms of healing grief, raising awareness about injustice, and facilitating community. 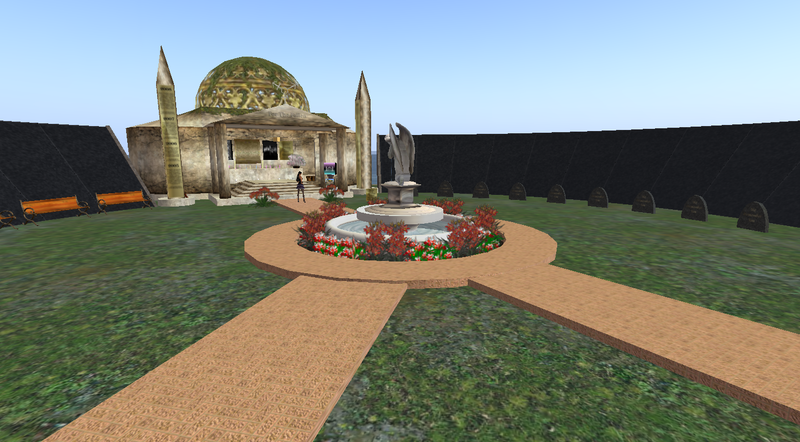 You can visit the memorial in Second Life at http://slurl.com/secondlife/Hejira/228/27/21/ As in past years, they will be holding a 24 hour vigil there on November 20, 2010. You contact Random Demin through Second Life or through the Foundation for Advancement of Transgender Equality, F.A.T.E. International. If The Web is Really Dead, What Have We Lost? A Wired magazine article recently declared that the World Wide Web (WWW) is dead, noting a significant decline in the last decade in the proportion of Internet traffic that is browser-based. Surfing web sites reflects only a quarter of our Internet use now; the authors report that we are increasingly using of a multitude of apps over the Internet in place of the Web: Skype, video streaming through Netflix, email, file transfers, corporate VPN connections, online gaming, mobile phone apps, etc. 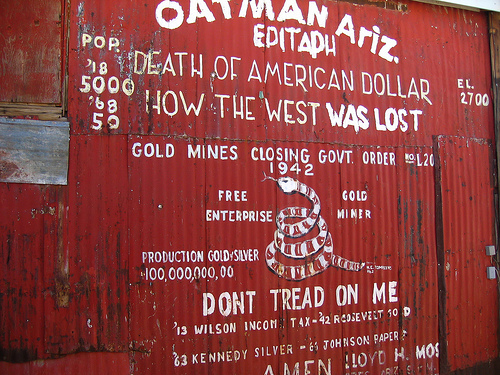 In some ways, the demise of the Web feels like a loss of our wide open spaces, like the end of the Wild West and Westward Expansion in U.S. history. Instead we are moving to an increasingly segmented (and organized) Internet world, one where you need to join a service, get the correct app, and, often, pay the fee. This specialization and the accompanying fragmentation are not new–it’s part of what happened with television when we moved from having a few shared broadcasting networks to the hundreds that are available through cable television. When this change happened with television in the United States what we lost was a shared dialogue space–a media town square, so to speak. Instead of having 3-4 main places that everyone watched and heard, we now have hundreds, with few (if any–Lost? American Idol?) rising to the level of a shared national focus. The positive side of this change was the increased diversity in what was available (although I still can’t find much I want to watch). The down side is that many of us stopped talking to anyone who was different–we started talking and listening to only those who reinforced our world view. The only time we have a shared focus now is when disaster strikes. Where Do We Come Together? I’m not sure that the WWW has ever given us what those 3-4 TV stations gave us: a place for us to listen and hear as one nation. And I know that those 3-4 stations didn’t speak for everyone–they didn’t really promote true dialogues across difference. But I do know that sometimes those dialogues occurred in the wide open spaces of the Web–sometimes we meet and interact with people who are different (in ways other than flame wars). So as the wide open spaces of the Internet decline, I wonder where our open communities will be. Right now, social networks like Facebook, Twitter, and YouTube have become some of the biggest spaces that are available to us. However, all of them allow us to customize what comes our way–the advantage of push technology. And of course, this same feature supports us talking with and listening to only what fits our reality. Sometimes there is content that crosses boundaries (goes viral). But most of the time most of us are talking and listening to those who think like us. As a social worker I know that diversity doesn’t have to divide–it can make us stronger. But for that to happen people need to communicate, understand, respect and learn from our differences. The decline of wide open spaces can decrease the likelihood that we will encounter difference–perhaps what we have lost here is the idea that such places can exist, for they didn’t happen often. But I don’t think the non-WWW Internet precludes having places to encounter and dialogue across differences; however, it will require that we plan, create, and then disseminate information about such spaces. And to do so requires that we deeply understand these new environments. The community organizers of the present–and the future–need to be able to work in virtual spaces as effectively as they do in neighborhoods and other types of real-world communities. While there are some amazing people are doing that now, I also know that many are still very uninformed about virtual environments, let alone familiar with how to build communities there. The descent of the World Wide Web is a call to action: to work together to create new open virtual spaces–perhaps they will be less wild, but they could still go a long way toward bringing diverse people together. In my last post I talked about some of the web-based tools that can provide a platform for people to share their grief. Now I would like to explore a bit when a social worker or a some other type of therapist might consider suggesting these tools to clients. Clearly, using an online platform only makes sense if someone is online and generally comfortable in these environments. But more and more this is the case. A recent Pew study of American Internet use found that large numbers of people are online from levels of 93% for teens and young adults to 38% among adults age 65 and over. Let’s start with the simple assumption that human interaction is helpful for people who are grieving, especially when it’s interaction that provides support and opportunities to remember the deceased. While our culture provides face-to-face opportunities for this human interaction, it tends to drop off quickly once the formal mourning rituals are complete. 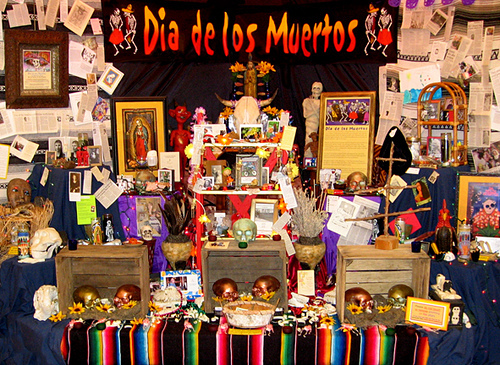 And people may have limited access to these real-world rituals because of distance, or relationship to the family of the deceased. Having alternate ways of sharing grief becomes especially important if people have limited access to the real-world rituals, but in a culture that provides little time and space for grieving, these ways can be helpful to many people. Of course, the strength of Web 2.0 tools is that they bring the means for creativity, collaboration, and connectivity to everyone on the Internet. So it only follows that Web 2.0 could be helpful to anyone who is grieving and is comfortable online. As was noted in Grieving in Virtual Spaces, there are range of online platforms that could be helpful to those who are grieving. However, the increased popularity of social networking sites suggests that these are the best places to begin. The Pew Internet Survey found that among those who were online 73% percent of teens and 47% of adults were using social networking sites like Facebook. Facebook pages can be created as an individual profiles, where people add someone as a friend; as a community page where someone joins the page by choosing to “like” it; or as a group, where someone chooses to join it. These last two situations lend themselves well to creating memorial sites. Creating a meaningful memorial Facebook site could be a remarkable healing project. In addition to providing a chance to pull together photos, videos, and music, there is the chance to share memories, poetry or notes with other members of the community. Moreover, similar to what can happen at a wake, people can learn about all the sides of who someone was through the memories and thoughts that others share. Over time, a sense of community can develop that can provide some ongoing mutual support as people comment on each other’s contributions. One advantage of using a community Facebook page as a memorial site is that it is an enduring place for people to go over time. At a time when mainstream U.S. culture is ready to take the focus off of grieving after the funeral, an enduring virtual page acknowledges that grief continues. As noted above, sometimes the page doesn’t start as a memorial site but is transformed into one after it’s creator dies. I have a friend who periodically will go to her deceased child’s Facebook page and leave the child notes. It reminds me of the experience I had of writing letters to my dad after he died, or the letters I have asked my clients to write to the people they have lost, except that these are shorter notes, probably closer to the snippets of conversation that can continue in our heads with someone who has died. Of course the other big difference is that this is public within the community of people who follow her child’s page. In this way, it is a very different ritual of grieving that has the advantage of letting a community know that grief continues (something our culture forgets) and that relationships beyond death in the hearts of those who cared for the deceased. It also allows a community the information they might need that would encourage them to reach out to a member who might be struggling. In this way, this tool creates new options for grieving–options that didn’t exist before Web 2.0. One important factor to consider when evaluating a venue is who will have control over the healing environment. For example, if the Facebook page started as an individual’s personal page, then it’s possible that at some point in the future the family might choose to remove the page–and, of course, the administrators of a community page or a group might choose to do the same, although at least there are more options to share the administrative roles for these pages with a group of people. Clearly if something is really important to someone they should select a virtual space that ensures they will have access–either because they have the direct control themselves, or because they know that others share their goals. For this reason, a site that is set up to memorialize someone has the definitive advantage of a clarity of purpose that makes it more likely it will be around for a while. 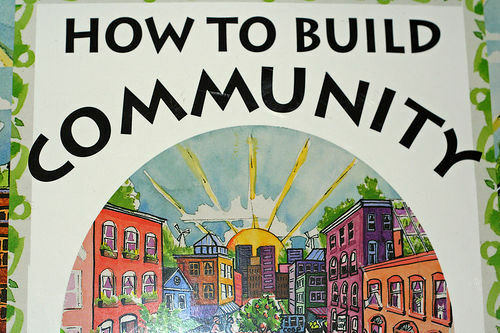 Photo Credits: How to Build Community courtesy of Niall Kennedy. Dia de los Muertos, courtesy of Michael Redman.